What’s the $1B investment in technology solutions and services all about? Today, Dell announced that we’ll be investing a lot toward data center and solutions functionality. Three events in Beijing, San Francisco and London kicked off the news. I wanted to take a few minutes to tie some of these details together. Over on Inside Enterprise IT, Jan’s post about breaking through the “Virtual Ceiling” discusses some of the details behind the Dell| Microsoft Management and Virtualization Solutions, Colin tells you what Dell vStart is all about, and speaking of vStart, Kong Yang’s post highlights it and mentions that members of Dell’s team will be on hand to discuss vStart in more detail on April 12 at 3pm Central Time. Update: Barton published two new posts on the topics we discussed yesterday. Here's the link to the Open Compute Project post. 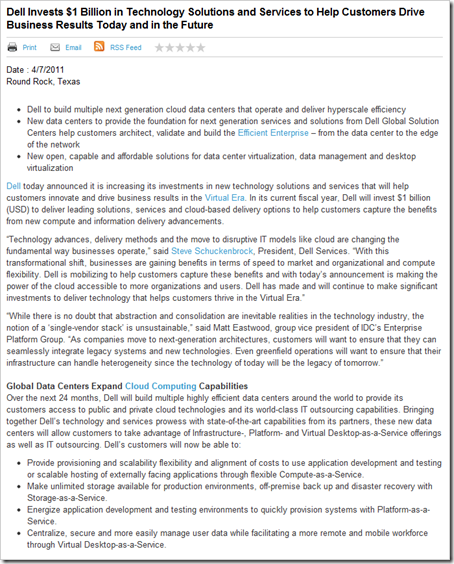 His other Billion Dollar Baby post discusses Dell's data center plans and Global Solution Center investments in existing facilities plus new build locations in (Washington D.C. Chicago, California, Brazil, Shanghai, Singapore, Tokyo Sydney and Paris). Follow the conversations on Twitter about today’s announcements via #SSVE and check out the photos and videos from our events in Beijing, San Francisco and London on Flickr. Why does Dell not thinking more strategical with their planned investments. You are forcing 'Dell Services', 'Cloud Computing' etc. –> thats fine, but there are strong competitors (HP, Amazon) in the established markets (US and Europe). So you should have a strategy to start in 'non-established' areas with huge potential. My question: Why you do not create an center in Latin America, which offers all available services (Cloud computing, Data Center etc.) – this would give Dell an enormous adavante against the competitors. Latin America (especially Brazil) do have a very strong growing market and still have a lot of potential. So just do it !